Why buy a new Ludwig Keystone X drum kit? Consider these new Keystone X Series Drum Features. 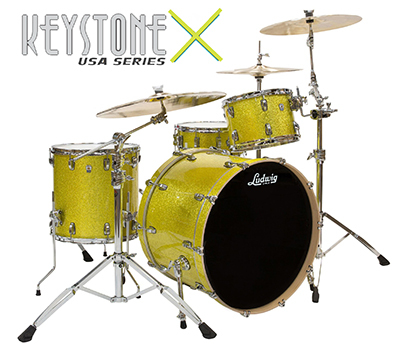 The Keystone x drums are configured standard with USA Remo heads which deliver low end punch and quick decay. A very tight controlled sound with minimal ring will put a smile on any studio or live house engineers face. Available now in seven bold new finishes. The Keystone X series also includes award winning Atlas Brackets, full width wrap bass drum hoop, cast claw, minted cast brass badge and the new low mass triad floor tom bracket for enhanced stability and positioning. Proudly made in USA. • Louder, more focused sound. This 5-ply combination creates a thin, dense shell that speaks loudly with quick, even decay. • Keystone Drums feature the Ludwig Classic lugs. The Ludwig Keystone X Probeat in Yellow Glitter. Featuring 16x24 bass, 9x13 rack tom, 16x16 floor tom (snare available separately) Made in Monroe, NC USA. The Keystone X Bigbeat in Arctic Oak. 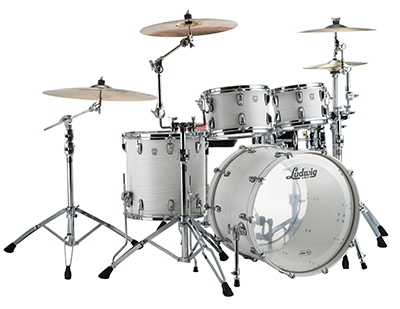 16x22 bass drum, 7x10 rack tom, 8x12 rack tom, 16x16 floor tom (snare available separately). Made with in the same factory as Ludwig Classic Maple and Legacy drums.